Glenn Harrold (born 21 June 1962 in Balham, London, England) is a British hypnotherapist and author of self-help books, Apps, CDs and downloads. Harrold studied for a diploma for two years at The British Society of Clinical Hypnosis. He began making home produced hypnosis recordings in the late 1990s and sold them directly to local bookshops and stores before starting his own publishing company, Diviniti Publishing. In 2006 he received a gold disc from Nielsen BookScan for £250,000 in sales of his Complete Relaxation CD. Harrold has also produced hypnotherapy CDs for BBC audiobooks and has written five self-help books for Orion Publishing in the United Kingdom. He has also written for McGraw Hill in the United States. In May 2011 he was made a Fellow of The British Society of Clinical Hypnosis. Harrold has been interviewed on BBC Radio 2's Steve Wright In The Afternoon show on three occasions and has also appeared on BBC One's BBC Breakfast show to discuss sleeping disorders. He has also been interviewed by Johnny Walker and Eamonn Holmes and been featured in British newspapers and magazine articles. In September 2009, The Daily Mail and Closer Magazine featured an article about some of the celebrities that he has helped to overcome addictions and phobias. In 2010 Harrold appeared on Wedding TV show So Would You Dump Me Now?. Harrold also writes and records music. His song Transparency won first prize at the International Song of the Year competition in the dance category. Another song, All of My Heart, was a finalist at the UK Song-writing Competition in the singer-songwriter category. Harrold has released 8 audiobooks in the BBC Audio Collection: Lifestyle from 2002 to 2007. Complete Relaxation, (Audio): Diviniti Publishing: 2000. Learn How to Think Positively, (Audio): Diviniti Publishing: 2000. Overcome Fear of Flying, (Audio): Diviniti Publishing: 2002. Overcome Exam Nerves, (Audio): Diviniti Publishing: 2002. Get Rich and Successful, (Audio): Orion (UK): 2009. Get the Love You Want, (Audio): Orion (UK): 2009. Detox Your Life, (Audio): Diviniti Publishing: 2010. Deep Sleep, (Audio): Diviniti Publishing: 2001. Develop Your Self-Confidence, (Audio): Diviniti Publishing: 2001. Build Your Self-Esteem, (Audio): Diviniti Publishing: 2003. Be Happy, (Audio): Diviniti Publishing: 2011. 396Hz Solfeggio Meditation, (Audio): Diviniti Publishing: 2012. Overcome Anxiety, (Audio): Diviniti Publishing: 2014. Mindfulness Meditation for Releasing Anxiety, (Audio): Diviniti Publishing: 2015. Mindfulness Meditation for Gratitude, (Audio): Diviniti Publishing: 2015. Law of Attraction, (Audio): Diviniti Publishing: 2016. Raise Your Vibration, (Audio): Diviniti Publishing: 2019. Create Wealth and Abundance, (Book & CD): Diviniti Publishing (UK): 2005. Listen and Lose Weight, (Book & CD): McGraw Hill (USA) 2007. De-Stress Your Life, (Book & Audio): Orion (UK) 2007, Reissued 2019. Sleep Well Every Night, (Book & Audio): Orion (UK) 2008, Reissued 2019. Look Young, Live Longer, (Book & Audio): Orion (UK) 2009, Reissued 2019. Lose Weight Now!, (Book & Audio): Orion (UK) 2010, Reissued 2019. The Answer, (Hardback Book & MP3): Orion (UK) 2011. The Answer, (Paperback Book & MP3): Orion (UK) 2013. 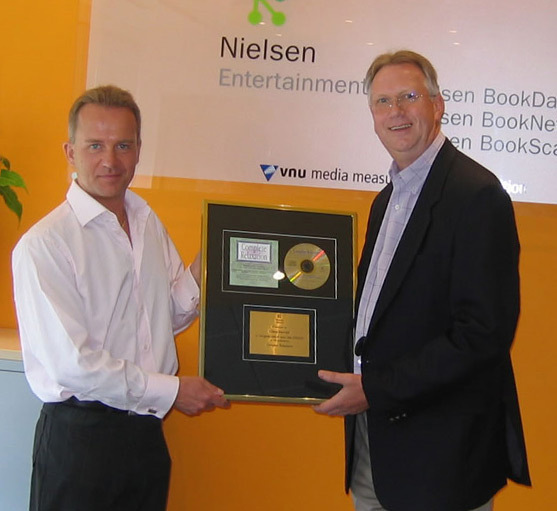 ^ "Receiving Gold Disc Award from Nielsen Book Data". London. Retrieved 7 February 2011. ^ a b "Two new CDs from Britain's best-selling audio hypnotherapist Glenn Harrold". BBC. 19 December 2005. Retrieved 12 September 2011. ^ "Orion Books – Glenn Harrold". Orion. Retrieved 17 June 2018. ^ "Listen and Lose Weight". McGraw-Hill Education. Retrieved 17 February 2017. ^ "BSCH Record Detail". The British Society of Clinical Hypnosis. Retrieved 17 June 2018. ^ "Andrea McLean recreates American Beauty poster after beating her sweet addiction". The Daily Mail. 15 September 2009. Retrieved 12 September 2011. ^ You did on the "So Would You Dump Me Now – Wedding TV". London. 17 February 2017. Retrieved 7 February 2011. ^ "International Song of the Year Winners 2006". London. Retrieved 7 February 2011. ^ "2015 Results". The UK Songwriting Contest - Official. Retrieved 17 February 2017. This page was last edited on 4 February 2019, at 21:16 (UTC).